Wilson Ultra Tour 95 CV Racquet Review - The racquet of Kei Nishikori? 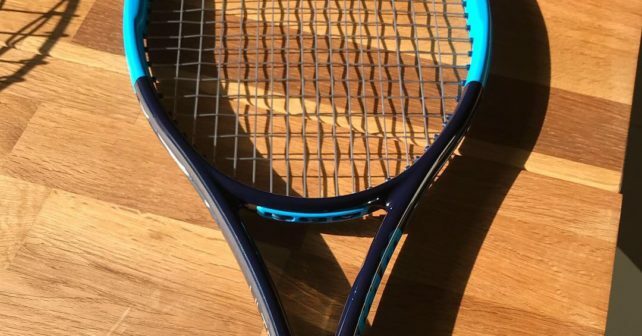 This Wilson Ultra Tour 95 CV Racquet Review will deal with the latest Ultra racquet as well as explaining why this is not the actual racquet of Kei Nishikori. Nishikori endorses the Wilson Ultra Tour 95 CV, but plays with something else. As you might know, I really enjoyed the Wilson Ultra Tour, that was low-powered and required some lead to play well. The Wilson Ultra Tour 95 CV requires no customization since the swing weight is already high due to the extended length. If you don’t know what CV means, it stands for Countervail and is the material that Wilson has chosen to dampen some of the shock and vibrations you get from stiffer frames. The dampening seems to work well, but the issue I have had with it previously is that it mutes some of the feel too much. Does it work better for the Wilson Ultra Tour 95 CV? Read on to find out. The Wilson Ultra Tour 95 CV is endorsed by Kei Nishikori. Racquet manufacturers now use the word “endorse” instead of “use” which makes sense since in 99% of the cases the pro player actually uses something else. In Nishikori’s case, he uses a racquet that was released some years ago called BLX Tour. My guess is that he has perhaps been playing with both the Wilson BLX Tour which is 27.7 inches long and the Wilson Ntour Two which is 27.25 inches long. Both specs have been found on Nishikori racquets if you check prostocktennis.com. Perhaps he went from the stiffer BLX Tour to the nTour Two to save his elbow and wrist a bit since the BLX Tour is quite a bit stiffer as well as longer. I don’t know this for sure. No matter what he actually uses, it is not the Wilson Ultra Tour 95 CV. But there are similarities since the Ultra Tour 95 CV is extended, 95 sq inches, and in case of the BLX Tour, has similar stiffness. The Wilson Ultra Tour 95 CV simply lands somewhere in between those two racquets. The reported swing weight of Nishikori is around 350, which sounds about right. The swing weight of the of the Ultra Tour 95 CV is not childish either at around 340. This means that this racquet plays quite stable and powerful, despite an unstrung weight of 309 grams. 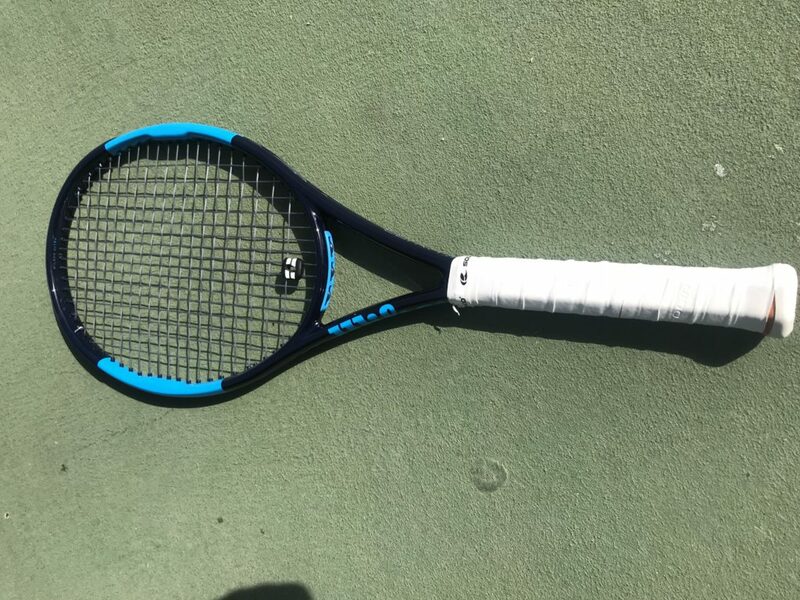 Extended length racquets naturally have higher swing weights and this one lands in my comfort zone, but a lot of players might find it too much to swing. I strung up the racquet with Luxilon Alu Power at 23 kg and I felt that string worked really well in this racquet. My first couple of session I played really well and noticed no timing issues with the extended length. But when the legs got tired it was a bit tougher to time the ball. The plow-through and power of this racquet is brilliant, but I had a tough time with touch shots. My favorite shots with the Ultra Tour 95 CV was the serve, slice and volleys that did not require a deft touch. If you feel at home with the Wilson Six One 95, this could be an interesting choice to crank up the power, but I thought it was too powerful at times. And the extended length made it hard to get a bit more wristy with my shots. I had good results on the court with this racquet, but it required me to be tuned-in and focused at all time. I must say I do like this slightly extended length. Some of my tennis friends swear by extended length racquets, but I have always struggled a bit with them. This one though was quite easy to adjust to. Definitely a racquet for advanced players who like to get enough power to end points quickly. I would not feel confident enough to get into long rallies with this stick, but if you are an aggressive player this could work to your advantage. You will hit plenty of flat winners and unreturnable serves. I think Wilson could go down a bit in stiffness with this racquet which would have held back on some of the power and created a more flexible and enjoyable feel. That would be my sincere recommendation because I think the extended length makes sense, the string pattern is good and the weight and balance works in the racquet’s favor. I also want to add that this is close to an identical racquet to the Wilson Burn CV 95 . The only real difference is the throat grommet which is the so-called Crush Zone that is talked about in the Asian market but not in Europe for some reason. It is supposed to soften the feel a bit more as I understand it. To get back to that and countervail, I did not experience any discomfort from playing with this frame, but the SW and stiffness can bear some strain on sensitive wrists so it is always good to try before you buy. To summarize, this is a decent racquet. Quite fun to hit flat winners with. But it can be cumbersome to a lot of players and is not packed with feel. I wish Wilson would perhaps have implemented some more changes to the racquet instead of just changing it over from Burn to Ultra. Or why not launch a Kei Nishikori Autograph model? More autograph models, please! I know the heft might not suit everyone though, but from a commercial standpoint, the Pro Staff RF97 Autograph sure was a success and you could perhaps imitate the strategy and release Light and Ultra-Light versions of the same racquet? What do you think of the Wilson Ultra Tour 95 CV? Is it something you would be interested to try? To be exact this is the very same Burn 95 CV with the Ultra Tour paintjob just because the Burn line is discontinued. I’ve played both lines and there is no difference at all except for the paintjob which I think the Burn it’s better looking, but that’s a personal preference. It doesn’t make any sense to release it as a brand new model and price tag it accordingly when it’s not and you can get the same racket for half of the price. I’d love to see your review of the Dunlop C200 +. As a user of the Burn 95 CV, I’d like to know if this Dunlop is contender for a replacement. Yeah, except for the Crush Zone it is the same stick. Would love to review the Dunlop CX 200+ – but not sure when that will be. Got a few reviews in the pipeline. I think it could well be a contender for the Burn! Appreciate the comment! In older pictures Nishikori and Kavitiva played the 27.25” orangey and blue blx, not the longer white blue red one. Does anyone know what racquet Alex de Minaur plays with?